This post is a little overdue. I was recently giving a large stack of vintage fabric reprints (I think my dear friends who gave them to me thought most of them were from the 40s?). This red and blue floral is my absolute favorite, but they are all great. And some of them quite… quirky. 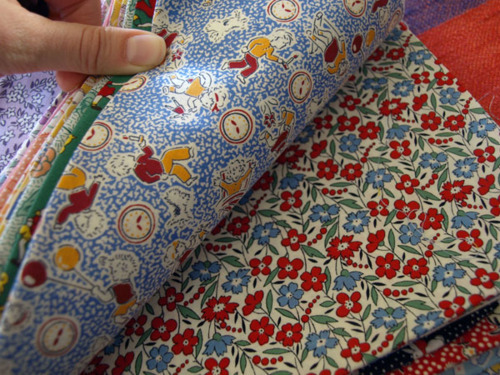 A lot of nursery rhyme themed fabrics too. I wanted to wait until I had something to show for it, but I think I’ll just give a sneak peek instead… so I’ll take this opportunity to say ‘thank you’ again! You know who you are, ladies.